FAYETTEVILLE, Ark. 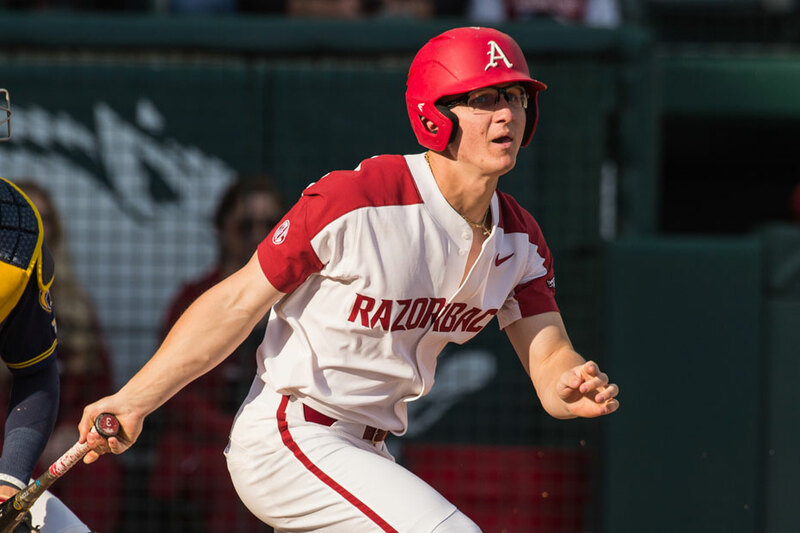 – Arkansas infielder Jared Gates signed a free agent contract with the Baltimore Orioles Friday, making him the 10th Razorback to sign a pro contract since the 2018 Major League Baseball (MLB) Draft in June. Gates is the first non-drafted Razorback to sign a pro contract this summer and second to join the Orioles organization. Right-hander Blaine Knight was picked in the third round by Baltimore in the draft and signed a deal last week. Hailing from Wichita, Kansas, Gates became a postseason hero for the Razorbacks over the last two years, earning the nickname “Mr. June” after coming up with clutch hits throughout the SEC and NCAA Tournaments. This year, in just the postseason alone, Gates hit .308, the second-best average on the team, with three home runs and six RBIs. Over his 16 games in the NCAA Tournament, Gates was one of the best, hitting .291 combined with 16 runs scored and a .365 on-base percentage. For much of his 2018 season, Gates platooned at first base before becoming the everyday starter for the remaining 15 games. He ended up hitting .241 over 46 games with six long balls and 23 RBIs. In his two seasons at Arkansas, Gates was a .243 hitter with 62 hits, nine doubles, 12 home runs, 37 RBIs and 28 walks. Gates was endeared by the Razorback faithful in 2017 when he hit a two-run home run in the eighth inning of the NCAA Regional final against Missouri State, a game that was played well into the morning hours the next day and did not finish until 3 a.m. In the regional-deciding game later that day, Gates went deep again, hitting his sixth home run of the year and was responsible for two of Arkansas’ five hits. Gates came to Arkansas prior to the 2017 season after spending two years at Iowa Western Community College where he was a second-team All-America selection and led Iowa Western to the Final Four at the NJCAA World Series.